Reflux into throat has a something in throat “globus “feel, throat clearing and annoying cough. When ulcer “PPI”pills fail one author suggests injecting T5-6, 1 cm from spine, to influence sympathetic nerve trunks and gradually reset the nervous system – for relief. injected 2.5 mls 0.5% lidocaine 1 cm lateal to spine process into tender point in multifidi. 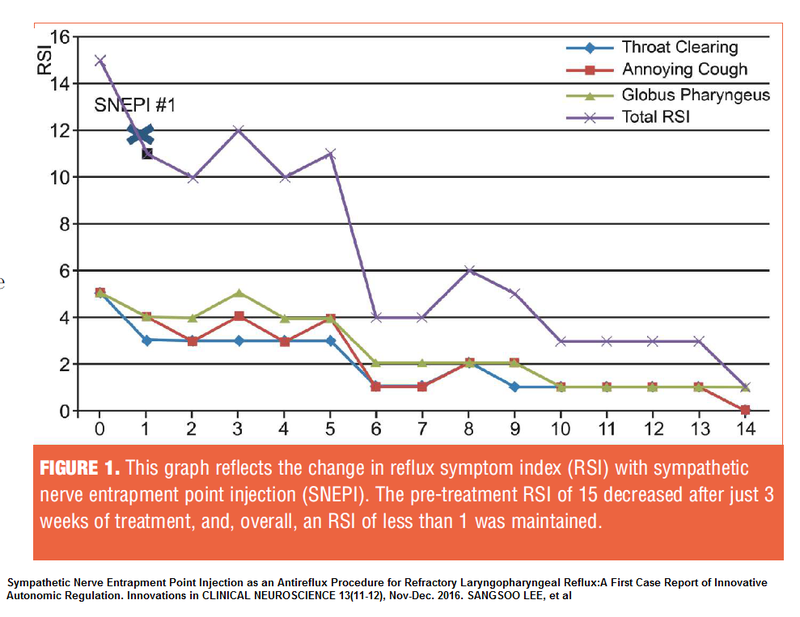 With repeated shots, sufferer with 10 years of “Laryngeaopharyngeal” Reflux recovered. Comment – Going too deep during injection will ask for spinal numbness, and the potential for cardiovascular collapse that can go with it, so has to be more superficial. Don’t know what to think but would have felt better if local area changes in sympathetic nervous system were demonstrated. Many years ago, a spot by T2 was found to be associated with stomach ulcers but doubt if treating it would get rid of ulcers.. This entry was posted in Abdominal pain, ENT, Injection. Bookmark the permalink.